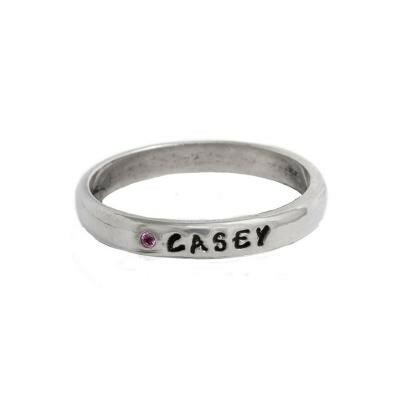 "Stackable Birthstone Grandmother's Name Ring in Silver, Flush Setting, Personalized"
Our single name ring with a birthstone is great worn alone or stacked with other rings. A perfect present for a first time grandma. Stack several together if you have multiple grandkids. Each sterling silver band will have a birthstone followed by a stamped name, a special word, nickname, bible verse or date ~ it's up to you! Our single rings can be stacked together or worn on either side of an existing ring. Wonderful gift for grandma. Personalize with the name of your child or grandchild and their birthstone or put on the word BLESSED, LOVE or a date and the stone for the month you were married or engaged. Our single band is simple and sophisticated. It is a great add on ring if you have ordered a double or triple in the past and then have another grandchild. This single band looks good stacked with our double, triple or our birthstone rings.